One year ago today, the all-female, singer-songwriter collective Song Suffragettes released the original song and music video for “Time’s Up”, a musical nod to the female empowerment movement that began in January of 2018. The song went on to receive major media coverage, critical accolades and ultimately raised $10,000 for the Time’s Up Legal Defense Fund through single sales and streaming. 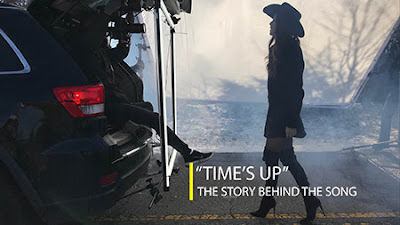 In celebration of this anniversary, Song Suffragettes just released “'Time’s Up’ – The Story Behind The Song” via their YouTube page which has amassed over 2.6 million views to date. Written by Kalie Shorr and Lacy Green, the song features the voices of 23 Song Suffragettes and pointedly addresses gender inequality and sexual misconduct against women with sharp lyrics like “we aren’t waiting anymore for the moon to turn the tides”. The accompanying music video features the following Song Suffragettes (women listed in order of appearance in the song): Kalie Shorr, Tasji Bachman, Chloe Gilligan, Savannah Keyes, Mignon, Gracie Schram, Tiera, Jenna Paulette, Emma White, Jordyn Mallory, Emma Lynn White, Regan Stewart, Kim Paige, Jenna McDaniel, Madison Kozak, Jenny Ray, Tenille Arts, Tristan McIntosh, Tia Scola, Alexis Gomez, Candi Carpenter and Trannie Stevens. For more information and to donate to the Time’s Up Legal Defense Fund, visit www.TimesUpNow.com.